A reconstruction of a radical alternative monetary system based on the the visionary ideas of the 18th century utopists August Nordenskjöld and Carl Bernhard Wadström. The proposed monetary system is — in contrast to other established monetary systems such as the Euro — not centrally controlled, independent of macro politics and not vulnerable to global financial speculation. 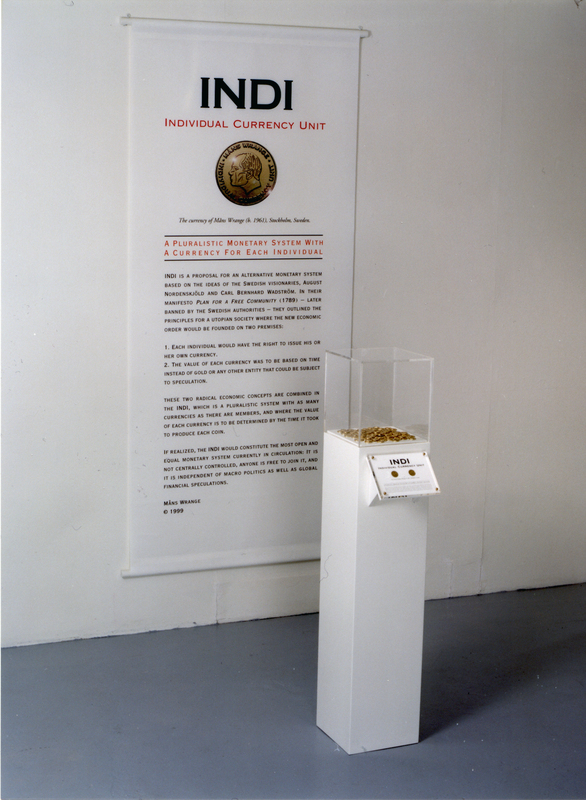 Presentation of the project INIDI (Individual Currency System) which consists of two coins displayed in a plexiglass frame, and 100 coins in a plexiglass display case. 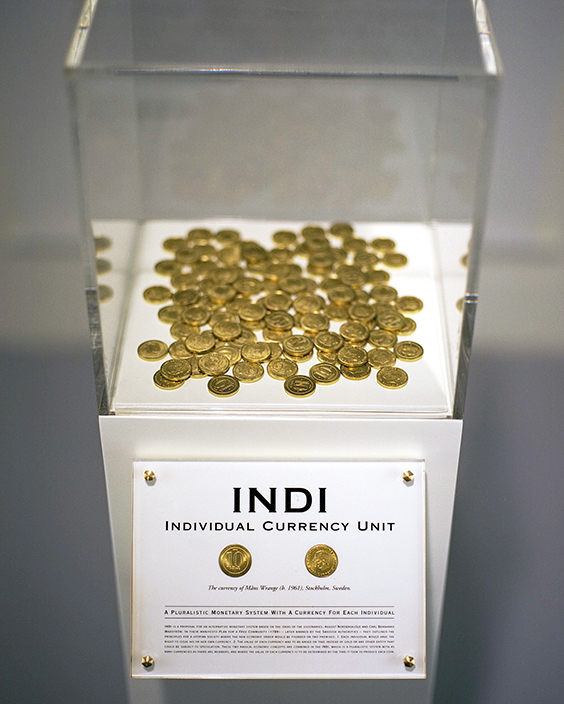 INDI (Individual Currency Unit) is a project which explores the visionary ideas for a new economic system that was put forward by August Nordenskiöld and Carl Bernhard Wadström at the end of the 18th century. Both Wadström and Nordenskiöld had previously tried, independently of each other, to change the economic system in Europe which, at the end of the eighteenth century, was being eroded by widespread currency speculation. Wadström had for example invited attendance at a European congress at which he intended to put forward a proposal for a new currency which would be based on grain rather than gold. Nordenskjöld had during the same period been able to persuade the Swedish king Gustav III to establish a secret alchemical laboratory at Drottningholm with the subversive aim — which was hidden from the king — of producing gold in such quantities that the gold standard would be worthless with the result that the whole financial system would collapse. Neither of these projects was, however, successful. 1. Every individual would have the right to issue his own currency. 2. The value of every individual currency would be based on time worked rather than gold or other speculative entity. How this credit system was actually to function in practice is not described in any of the available writings of Wadström and Nordenskjöld, and they did not succeed in realizing their plans. Their pamphlet was instead banned in Sweden, and they were obliged to go into exile. The project INDI takes the above two premises as the starting point in order to fulfill Nordenskjöld’s and Wadström’s vision of a new and juster economic order. This proposal for a new currency system, which have been termed INDI (Individual Currency Unit) runs counter to the contemporary European development of a strong, common currency, the Euro (European Currency Unit) with the power to exclude other — primarily non-European — weaker currencies. If INDI were to be brought fully into effect, it would probably provide the most open and egalitarian currency system in existence: It is not subject to centralized control; anyone can be a member by exchanging their individual currency and it is independent both of macropolitics and global financial speculation. There are today – 200 years later – several alternative monetary systems which resemble the visionary ideas of Nordenskjöld and Wadström, e. g., LETS (Local Exchange Trading System), Ithaca HOUR and the Bitcoin. Installation at the exhibition Transpositions at the South African National Museum, Cape Town, 1998. The Swedish 10-krona has been used as the modell for the design of the INDI. 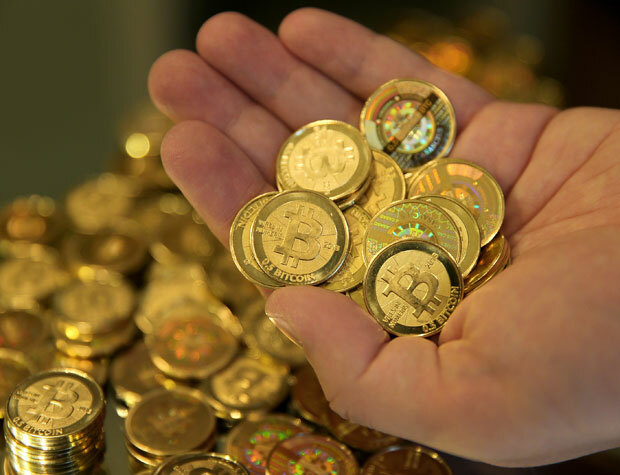 Denarium Bitcoin which is a physical coin which has actual bitcoin value inside. The coin is produced by the Finnish company Denarium, which also operates the largest Bitcoin exchange in Finland and Bitcoin ATM network in the Nordics.